Kinetic sand is a go-to sensory item in our house. My three year old particularly enjoys it and requests to play with it at least a couple times per week. Kinetic sand is fascinating to play with by itself, but by adding one or two items from around the house, you can sneak in some extra learning. 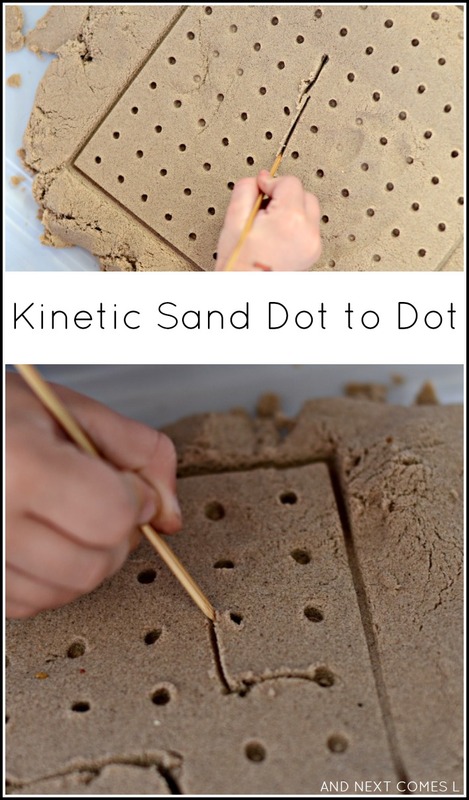 This kinetic sand dot to dot activity encourages writing skills and reminds me of that box drawing game from my childhood. I don't remember what the game is called, but you take turns with another person drawing lines on a grid with the goal of making as many boxes as you can. So this activity was a great way to stamp, draw, and write. First, we stamped the geoboard onto the kinetic sand so that when the geoboard was lifted, there was a 10 x 10 grid. And yes, we are full swing back into temporary tattoo mode at our house (note the Super Mario themed tattoos!). Once we had the grid, the boys started connecting the dots. K is still mastering straight lines, but he loved using the dots to build his letter writing and shape drawing. Five year old J was more precise. He drew boxes and wrote teeny tiny numbers in the boxes as he went along. He definitely did this activity like I remember playing as a kid (only I used paper and a pen). 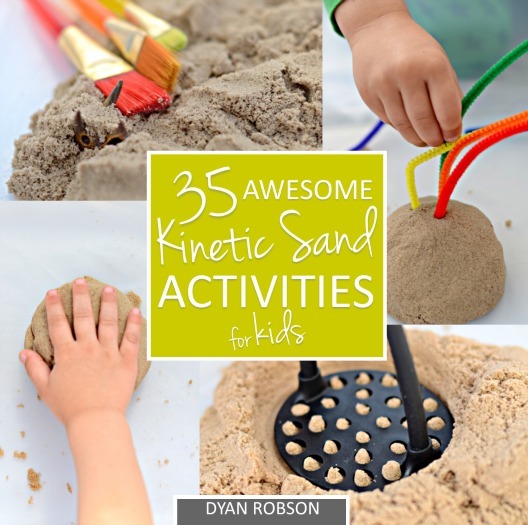 Don't forget to try out these other awesome kinetic sand ideas! This is a really cool activity, Dyan!